I remember having written about Boston winters a couple of years ago when I just got back to India, and how the change of seasons is so obvious in the European and North American lifestyle; the environment, clothing and most importantly, the produce. For us the change of seasons might not be that harsh but the winters bring a bounty of produce and a change in our eating habits that’s rooted, unique and inspiring. 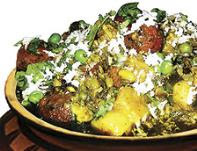 Whether it’s the Nihaari of Lucknow and Delhi, the fluffy milk froth (Malayyo in Benares, Daulat ki chaat in Delhi and Nimish in Lucknow), the Paya shorva of Hyderabad or the erstwhile shikaar (game) dishes of the royalty, the food of regions with an underlying Mughal influence is directed primarily by the phenomenon of Taseer (the heating/cooling effect of an ingredient on our body) and a bit by the seasonal produce. Oh, and not to forget mentioning the Kaali Gajar ka halwa from my city, Lucknow. The regions that are influenced heavily by produce are Gujarat and Punjab. The Sarson ka Saag with gur and Makki ki roti is a true celebration of winter and will always remain a perfect example of a farm to table dish. Not to forget the Kanji, a fermented drink made with black carrots and mustard, the Malpuas and the Paneer Jalebis that cannot be given a miss. Another Indian region that celebrates seasonal cooking, especially winters is Bengal, Nolen Gur is truly the most remarkable sweet ingredient ever and Nolen Gurer Sondesh is the king of winter mishti (not to forget the Nolen Gurer payesh, nolen gorer rosogulla). It all starts with Telebhaja and sun-filled conversations that mark the advent of winters . The live fish are suddenly in demand (Mangur, shini and shol maachh) as they are believed to be warming, and pulkopi (cauliflower) dishes in Pice hotels complete the circle. Oh and did I mention the I, our version of the crepes stuffed with payesh or khoa? And that for you is a very small glimpse of winters in Bengal!! However, in my opinion Gujarat takes the cake when it comes to celebrating winters. The unique produce that floods the market is remarkable and exciting for any chef — rattail radish (mogri), gumberries, lilua, winter greens and not to foget the green garlic. There would only be a few dining experiences better than enjoying Undhyu on a rooftop while flying kites on a chilly afternoon. Or the freshly roasted Ponkh (tender green jowar) or the one bite heartwarning lilwa (fresh toor) kachoris. The use of urad and spices (especially black pepper) in ladoos (uradiya) and other mithai is prevalant. Another popular non vegetarian Bohri Muslim winter dish is the “dhokla” not to be confused with the farsaan, this is actually a mutton undhiyu with lots of surati papdi and green garlic that will leave you wondering why winters don’t last the entire year. Gujarat (especially south Gujarat) for me is a “must visit” state in winters (and all my Gujarati friends are on the frequently dialled list). I strongly suggest you do the same to make this winter memorable and friendships around food longlasting. Brace Your Stomach...! Winters are coming :) Nicely captured Ranveer.